Looking for a New Hyundai Kona in your area? 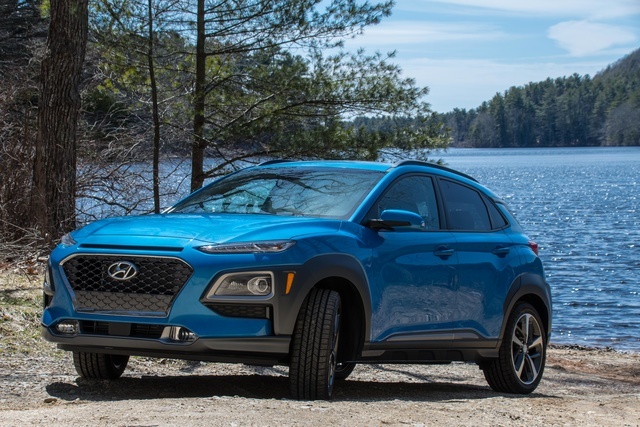 CarGurus has 886 nationwide Hyundai Kona dealers with 40,019 new car listings. Crossovers are all the rage right now, and no category is hotter than the subcompact segment. Not wanting to miss out, Hyundai threw its hat into the ring last year with its Kona model. The Kona offers reasonable pricing, plenty of space, and quirky styling. Fresh off its introduction in 2018, it gets no changes for 2019. It’s hard to miss the Kona. The split-level headlights and giant grille are liberal expressions of the brand’s current design language, and the crossover is ostentatious in colors like Surf Blue and Lime Twist. You can even get a color-contrasting roof. Still, Hyundai took great pains to make sure the Kona fulfills its mission for utility. Every trim has 6.7 inches of standard ground clearance, and the gray cladding on its lower perimeter is easy to clean. Inside, it accommodates up to 5 people and holds 19.2 cubic feet with the rear seats upright, or 45.8 with them folded. Every trim other than the base gets standard roof rails. Beneath the hood of the Kona, you’ll find one of two powertrains. A 2.0-liter inline 4-cylinder engine, making 147 horsepower and 132 pound-feet of torque, serves base duty. It pairs with a 6-speed automatic transmission. Hyundai offers a turbocharged 1.6-liter inline 4-cylinder with 175 hp and 195 lb-ft of torque, paired with a 7-speed dual-clutch automatic transmission (DCT). With either engine, you’ll get standard front-wheel drive (FWD) and optional all-wheel drive (AWD). Fuel economy is as high as 27 mpg city, 33 highway, and 30 combined for the base 2.0-liter engine, or 28, 32, and 30 with the 1.6-liter turbocharged engine. The Kona’s lineup consists of four simple trims: SE, SEL, Limited, and Ultimate. The base SE trim comes well-equipped with the 2.0-liter engine, 16-inch alloy wheels, body-colored mirrors, a rear spoiler, LED daytime running lights, automatic headlights, a 7-inch touchscreen infotainment system with Apple CarPlay and Android Auto, and a rear armrest with dual cupholders. The SEL trim bumps the wheels up to 17 inches and includes keyless access and start, heated front seats, HD and satellite radio, voice recognition, heated side mirrors with integrated indicators, roof rails, a leather-wrapped steering wheel and shift knob, and a hidden storage area beneath the cargo hold. The available Tech Package adds a power sunroof, fog lights, and an 8-way driver’s seat. The Limited offers the Kona’s first taste of luxury, with everything from the SEL with the Tech Package, the better 1.6-liter turbocharged engine, 18-inch alloy wheels, a chrome-framed grille, LED headlights and taillights, painted fog-light surrounds, leather upholstery, an 8-way power driver’s seat, automatic climate control, and an auto-dimming rear-view mirror. Finally, the Ultimate comes with a heads-up display, an 8-inch LCD touchscreen with navigation, a garage-door opener, an Infinity sound system with 8 speakers, a 4.2-inch instrument cluster LCD, and wireless charging. The Kona gets the full monty for safety features. A reversing camera comes with the base SE. Blind-spot monitoring, rear cross-traffic detection, forward-collision warning, automatic emergency braking with pedestrian detection, automatic high beams, driver-attention warning, lane-keeping assist, and reversing sensors all become available as you scale the trim ladder. The Kona received a Top Safety Pick Plus designation from the Insurance Institute for Highway Safety (IIHS). The 2019 Hyundai Kona is a smart buy if you want a full-featured and fun-styled vehicle that tops out below $30,000. What's your take on the 2019 Hyundai Kona? Have you driven a 2019 Hyundai Kona? Enter your zip to see incentives for a new Kona in your area. CarGurus has 8,381 nationwide Kona listings starting at $15,094. Is there a place in the car to insert the key that comes with the fab besides the driver’s door on the 2019 Luxury Hyundai Kona?